Sometimes, the announcement of a title seems to be the answer to your prayers to the video game gods. LotR: War in the North was one such case for me. I’d been whining for some years about how the current generation of consoles suffers a shortage of truly great dungeon crawlers and fantasy hack-and-slash games. I think many of you share my lament in this area, and we’re quick to point to titles such as Balder’s Gate: Dark Alliance and Champions of Norrath (both developed by Snowblind) as great games of this type on the last generation of consoles. When Snowblind announced they were working on a new title in the LotR universe, I was pretty darn happy. After getting some hands-on time with the title PAX East last weekend, I can safely say this game is living up to my extremely high expectations. I actually played the demo twice through, once on the dwarf warrior and once on the human ranger. The elf mage was always being played by a representative as he or she guided the other two players through the game. While the fellowship of the ring is coming together and heading out on their adventure, our three heroes are foraging north to confront a great evil stirring there. Without our aid from afar, the fellowship cannot prevail. 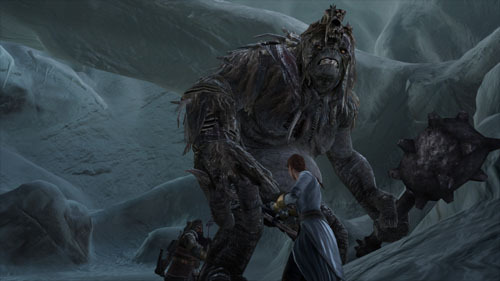 The demo plunked us down in the middle of some snowy mountains infested with orcs, trolls, and Uruk-hai. As we proceeded to start dishing out the pain, it became almost instantly clear that this was a game built for co-op from the ground up. One way this was apparent was how the different characters’ skills worked: for example, the elf mage had a big bubble shield that could soak up missiles so we weren’t getting hit by them and the dwarf warrior had a shout that could taunt enemies away from the other players. All the characters had ranged and melee stances they could switch between, and though I was told that one character may start off with a slight affinity towards one or the other, you could boost your effectiveness in ranged or melee through stat points as you level up. So if you want your dwarf to be a ranged fighter, you can do that. All of the characters also get special ranged skills and melee skills which you can again pick as you level and pick which ones you want to boost up. There was also a type of combo system. As I continuously hit an enemy without getting hit, eventually a little gray cloud over their head resolved into a little yellow Y button. When I hit Y, I entered a “heroic mode” where I believe I did more damage for a short period of time. I found this type of system was a good balance between rewarding players for playing smart (e.g. rolling around to avoid blows), yet not punishing them too harshly whenever they get smacked. Heroic mode was far from god mode, and it didn’t last a very long time at all. It seemed like something to be sought-for, but not necessary to get by. Combat’s all well and good, but what about the loot that’s so integral to these types of games? Chests contain a good amount of loot for each player, and it’s personalized, so you don’t have to worry about who gets there first as every gets his or her own separate stash. There were two small details about the inventory that I found particularly delightful. First, whenever one of your party members is in their inventory messing around with stuff, an icon pops up on your screen with their portrait and the word “inventory” displayed below. No more shooting enemies, then sadly wondering why your friend was just standing there while you were murdered! Second, if you pick up a piece of gear that one of your friends might want, you can gift it directly to their inventory. No more dropping everything on the ground, then having to play armor musical-chairs as you try to pick up the piece you want. 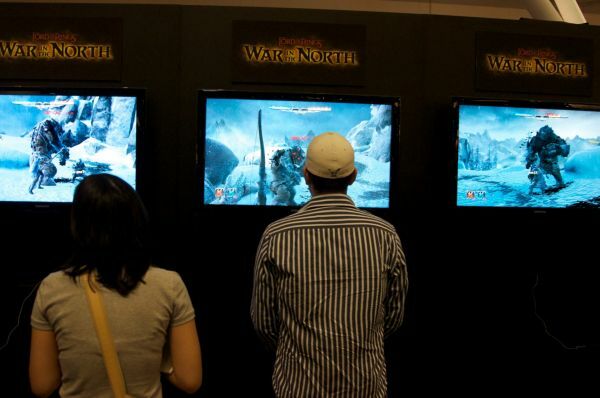 As far as connectivity goes, War in the North will still be offering a ridiculous number of ways to co-op, complete with 2-player splitscreen, 2-3 player LAN, 2-3 player online, and 2-player split with the third player networked or online. Much to our relief, we were informed that everyone gets their own character(s) which they can then import into whatever game they wish. The only restriction is that only one of each type of character can be in each game, so one elf, one human, and one dwarf. Sorry, guys, no tri-dwarf team allowed! 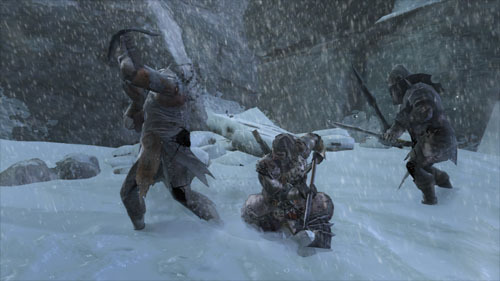 My time with War in the North was a blast, and I’m certainly looking forward to the game’s release. From all that I’ve seen, it’s all I wanted and then some. Page created in 0.2229 seconds.